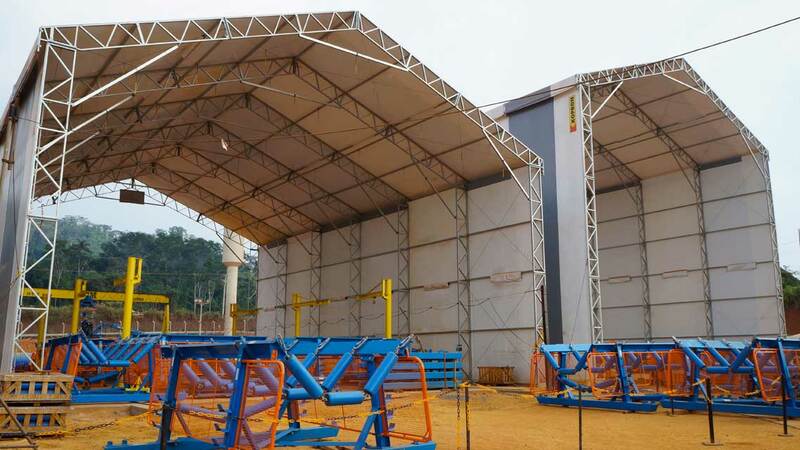 Kopron do Brasil designed and installed three special warehouses 20 m tall to create new temporary storage areas for this great international company operating in the fuel gas, energy and mine sector. Kopron do Brasil leader producers of logistic equipment have established a cooperative relationship with a well known International Italian company. Techint Engineering & Construction, which is part of the Techintcon Group leaders in the oil & gas, energy and mines market segments, with over 60,000 people working all over the world, applied to Kopron to manufacture and install these special warehouses with considerable height. Project was developed in short time at the Canaan (Parà) mine valley, and consists in two warehouses of 600m2 each, one tall 10 m the other 14,5m; the third warehouse is 650 m2 with a height starting from 15m to 20m at the center. Total area covered: 1850m², for hosting lorries and cranes used by Techint for steel products. The covering fabric is anti-tear, Class 2 – self-extinguishing. Giacomo Niccolai, General Manager at Kopron do Brasil proudly said “The warehouses produced for Techint are the evidence that we are perfectly able to supply tailored projects for any purpose without limits of space; Kopron have been the only reality which managed to offer a solution meeting the company’s need of great space in short time without having to build a structure in concrete”. “Easy installation and structure flexibility are the aspects which have always characterized our structures” said Sebastiano de Silva, sales agent operating in area of São Paulo. “Years of experience built by our technicians in the International field, have made our technicians become more and more sensitive towards the slightest structural and functional requirement of our customers”. The warehouses have been built strictly according to standards ABNT – NBR 6123 for wind loads– and NBR 6323 – regarding Hot Dip Galvanized or Iron Cast on steel products. Kopron do Brasil ha also provided to install the lighting system inside, and covered some parts in transparent, Energy Saving PVC.